Working within the confines of a classic “L” shape this kitchen needed to combine all the practicalities synonymous within German technology whilst still delivering the designer look. 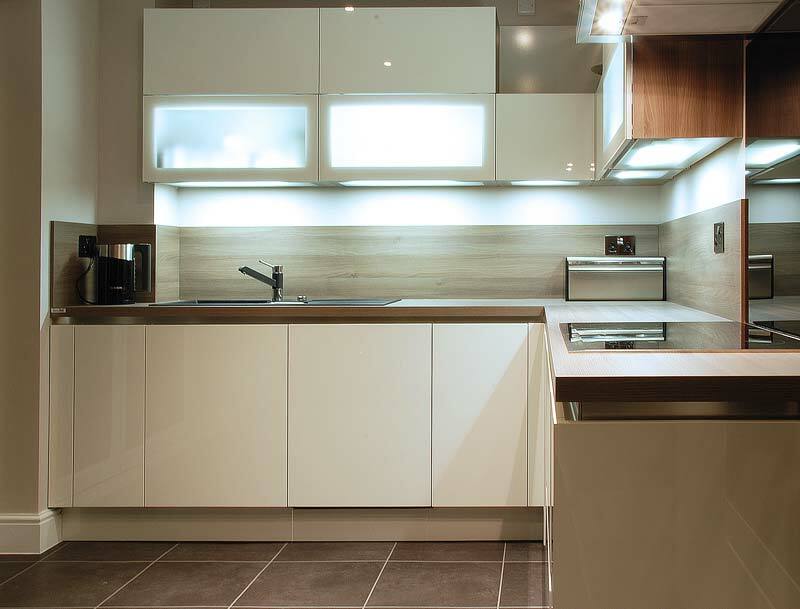 The phrase “A place for everything…” describes the consideration given to the hidden workings of the kitchen, with clutter free living the goal. The breakthrough came with the idea to set the midi-tall unit bank into the wall recess. This compact bank provides housing for the appliances along with two separate types of larder storage. By segmenting the units both traditional shelving and pull-out systems are incorporated to maximise the usability of the space available. 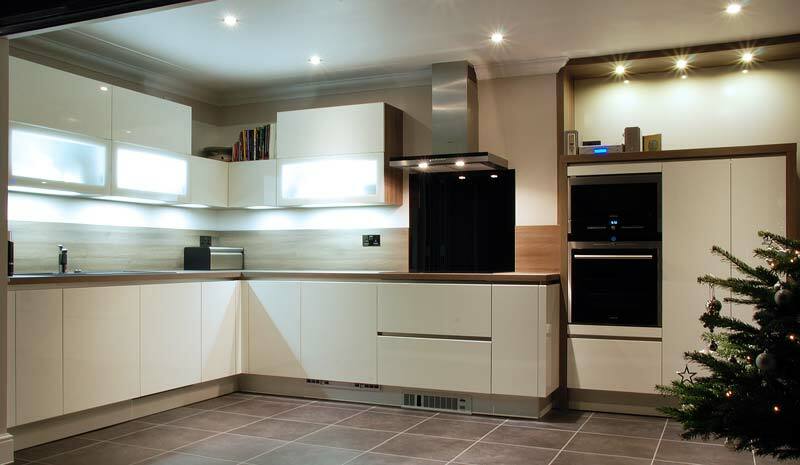 The LED lighting built into the fly-over shelf above the units, creates an usual but eye catching area. 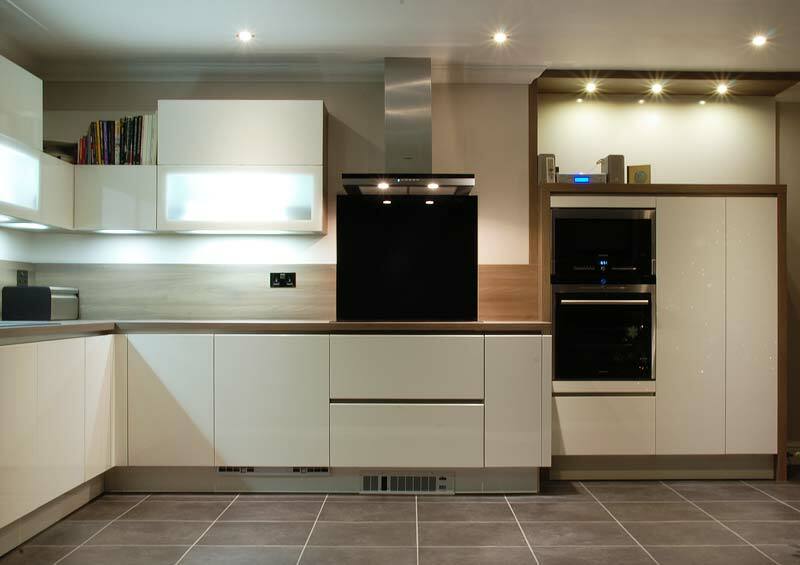 The handle-less base units are arranged to incorporate exactly the right amount and type of storage, with everything from pan draws to pull-out racking neatly concealed behind the handle-less lacquered fronts. Matching Grey Acacia worktops and panelling compliment the flyover shelf section and provide a subtle backdrop for the illuminated wall units. Combining both glass and solid fronts the wall units meet neatly in the corner to create another handy storage area for cookbooks and the like. On visiting the site it was great to see this kitchen really does provide “A place for everything…” The range of storage options available coupled with the the simple, unfussy design create a kitchen that allows for uncluttered, family life. Design details like the flyover shelf and the segmented wall units lift the design to another level, creating interesting effects whilst never compromising the functionality of the kitchen. Expertly installed by our fitters, this kitchen shows how the ordinary can become extraordinary with a little bit of Black Rok magic.